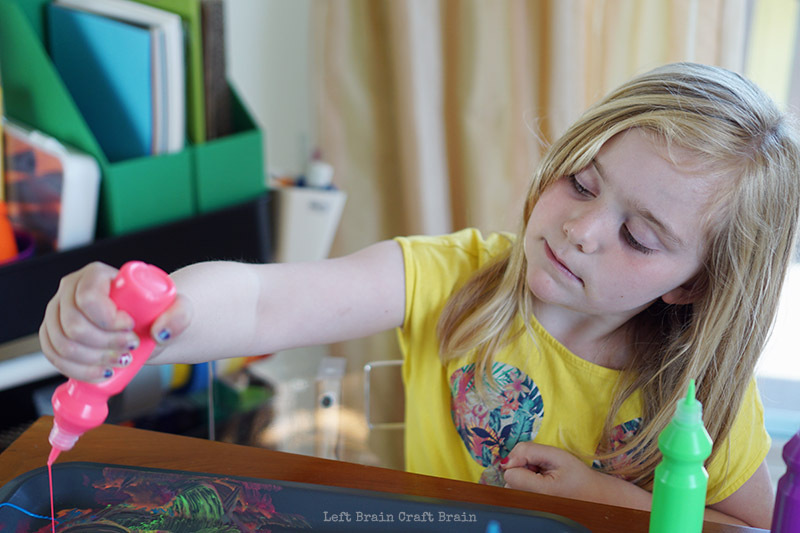 Do you have a child who likes to create? Or maybe want to encourage them to? Is something holding you back? I know for me, it’s sometimes the mess. Or maybe the effort of pulling it all together. 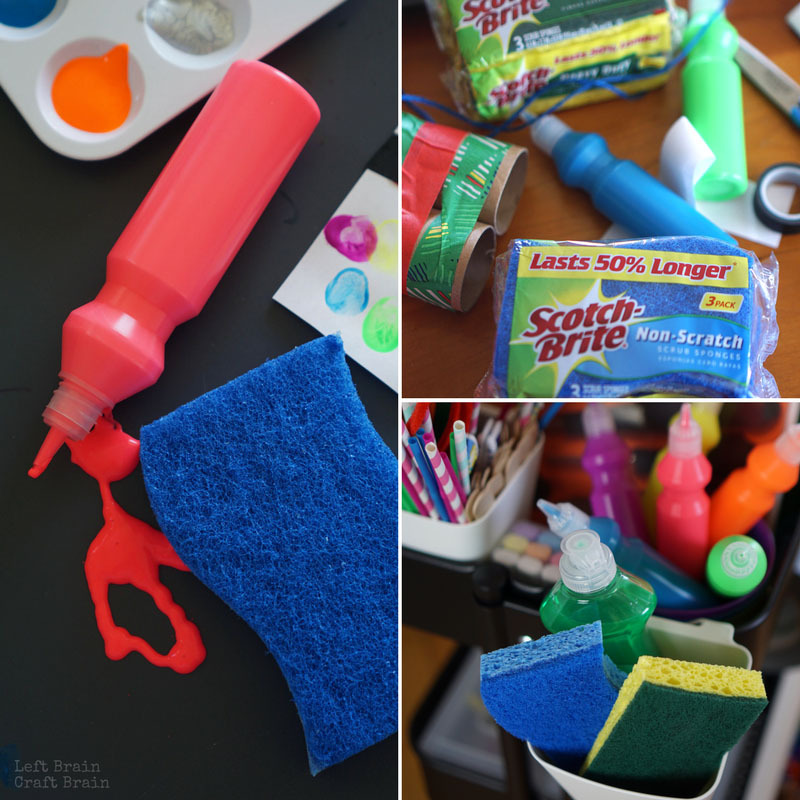 Today’s post is all about making creating easy in your house with easy to access supplies. 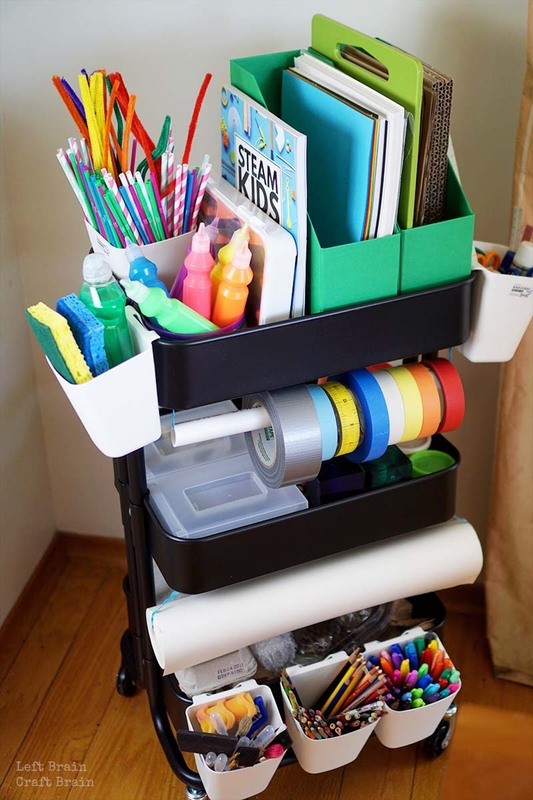 This Mini Maker Space Cart for Kids will inspire kids to create, and not just your average art projects. It will inspire them to build, to explore electric circuits, and to learn with STEAM (science, technology, engineering, art, & math). So I’ve dug alllll through Pinterest to find ways to organize my world. And I keep coming back to the cart idea. Because in our house, we do our projects allll over the house. In the kitchen, in the dining room, in the office. So I wanted our supplies to be mobile. And I wanted it to fit our STEAM-inspired life too, with some more advanced making supplies. So what do you include in your cart? First, start with what you have… Grab all the craft supplies hiding in the kitchen or the closet or the kids’ rooms and put them all together. It helps to know what you have to pull it all together. Then you’ll need a cart. 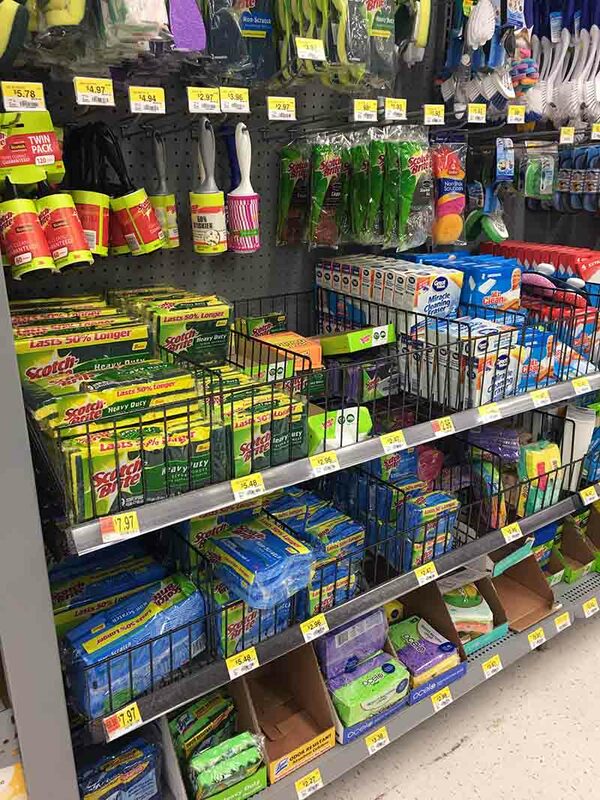 Walmart has some good ones. Then think through the type of projects you want to do with the kids. All about engineering? Stock the cart of of recyclables, connectors, LEGO bricks and more. All about tech? Bring in the electrics. We’re all about STEAM (science, technology, engineering, art, & math) so we did a mixture of all of those. To make pulling together your mini maker space super easy, I’ve pulled together this handy free printable for you. 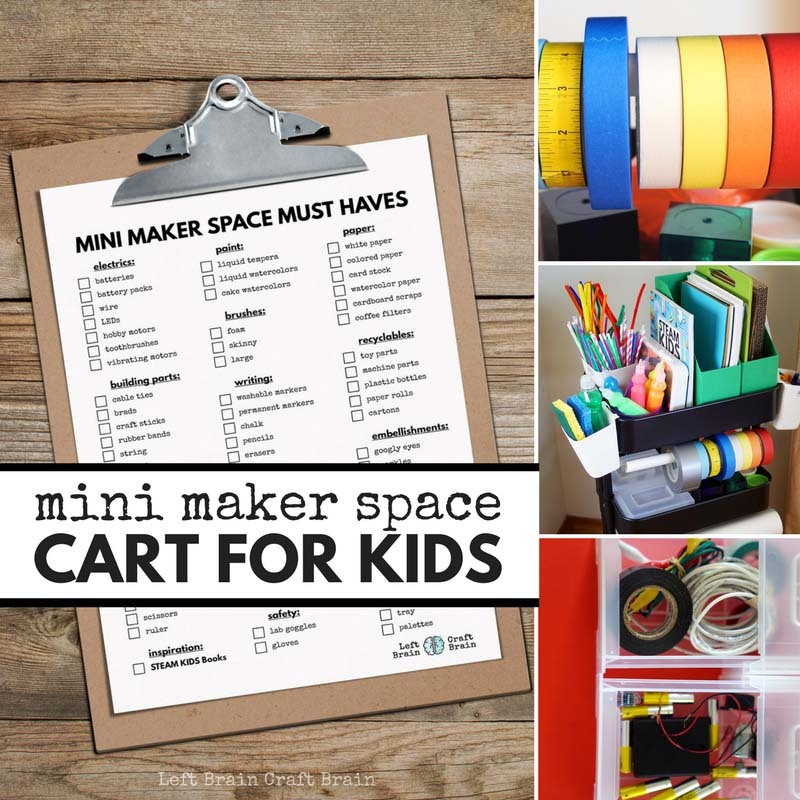 It’s a checklist with everything you need to start a killer maker space for your kids. 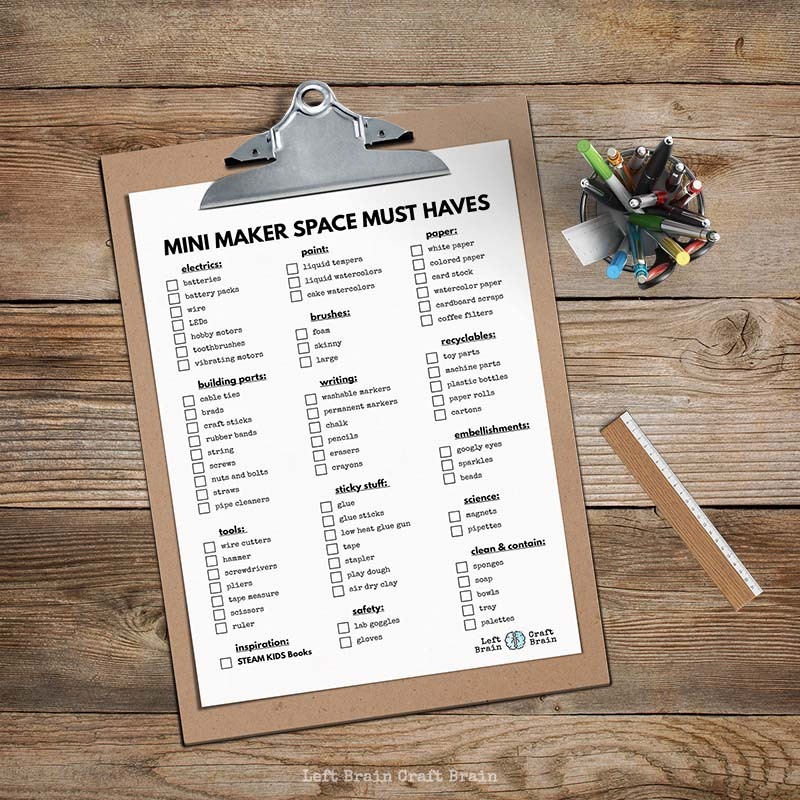 CLICK HERE TO DOWNLOAD YOUR MINI MAKER SPACE MUST HAVES CHECKLISTThen think about the containers. You want cups to hold tall skinny stuff like pencils, rulers and pipe cleaners. And you’ll want some of those magazine boxes to hold paper and scraps. And a couple of lengths of PVC pipe and some ribbon to hang your tape and art paper roll on. One of the things people often mention when they talk about creative projects with kids is the mess. Like as in Capital M MESS. And I’ll be honest, there is mess, but if you plan ahead for how to contain it and how to clean it, mess becomes WAY more manageable. So first, make sure your cart has some super functional containment items like a tray, bowls for small parts, and palettes for paint. And definitely include some cleanup tools. So one of the critical parts of the cart is the clean-up side because I like to keep my cleaning tools right nearby where the messes happen so I’m ready when the paint starts flying. And sponges are my go-to clean up trick. Call me #TeamSponge :) In my cart are a Scotch-Brite® Heavy Duty Scrub Sponge, Scotch-Brite® Non-Scratch Scrub Sponge and some soap. Non-scratch blue for my table, and green for those heavy duty messes. Are you #TeamSponge too? or maybe you’d rather use a dishcloth. 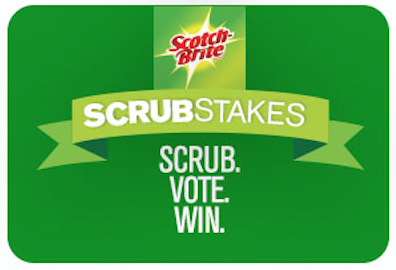 Either way, the Scotch-Brite™ Scrubstakes giveaway is giving you the chance to win a $20,000 kitchen makeover! Kind of like a maker space for mom, right? Invitations to Create are just open-ended set ups that allow kids to explore the process of art, not just the final product. I like to lay out a tray before school pickup with paper and whichever art supplies I think my daughter will love that day. That way it’s ready when things get chaotic after school and during dinner prep. And she gets to be as creative as she wants. We do a lot of electric projects around our house. 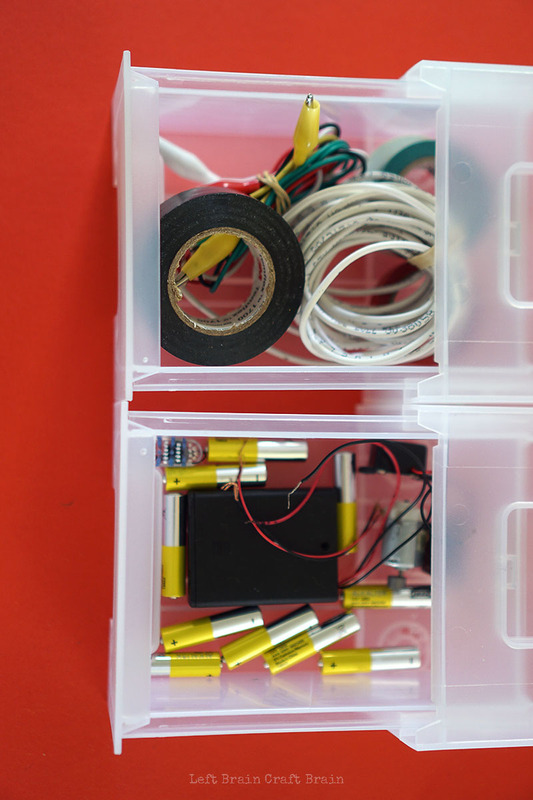 So I made sure to include a couple smaller boxes in the cart for things like wire, electrical and copper tape, motors and LEDs. These little drawers are perfect for containing these parts, but a quick safety note. If you have littles around, don’t leave batteries out for them to access without parental supervision. Want to learn about some of the cool circuit projects we do? Think bots and paper circuits and fruit. 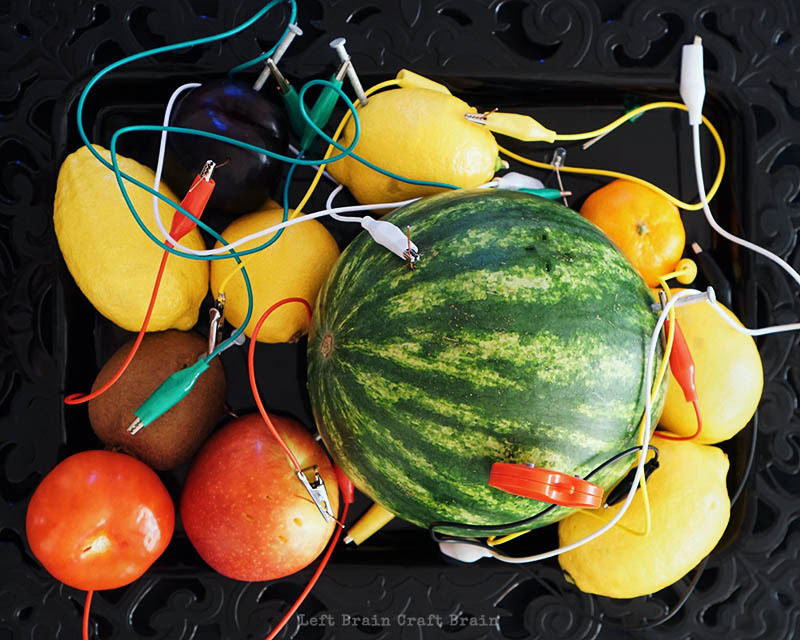 Yes, fruit :) Click on over here to see them all, plus a cool introduction to circuits for kids. Tinkering is huge in our house!! 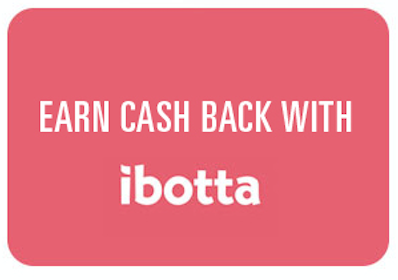 All you have to do is grab some trash (i.e. 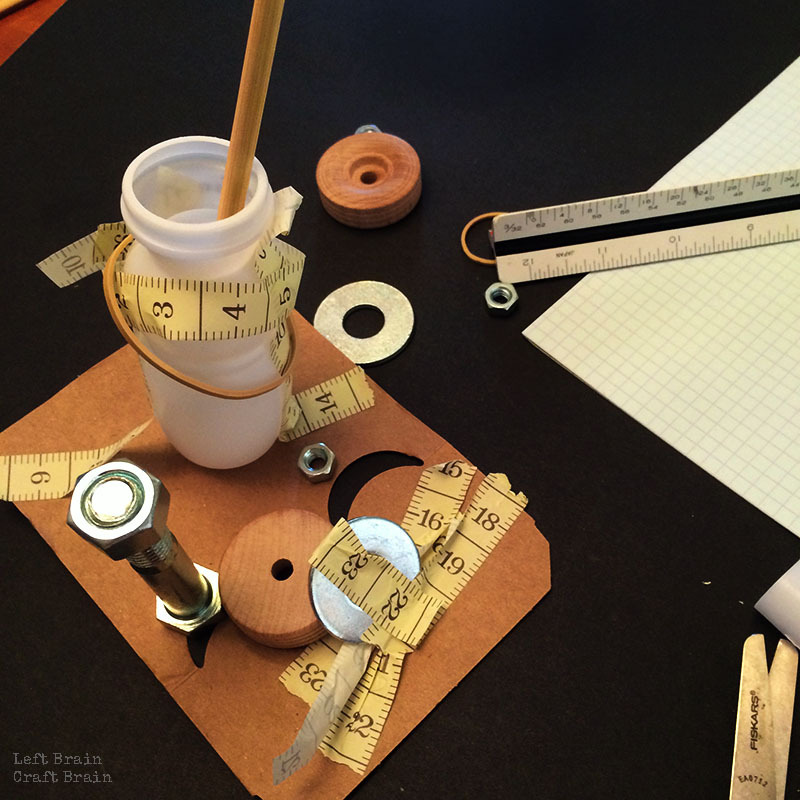 recycled cartons, rolls, toy parts…) and start designing and building. And don’t stress about the outcome! I asked my daughter yesterday what she was building. She said “I dunno. But it’s cool.” So stock the bottom shelf of your cart full of recyclables and wheel it over to the table to get the creativity brewing. And try this Tinkering Station for Young Engineers. 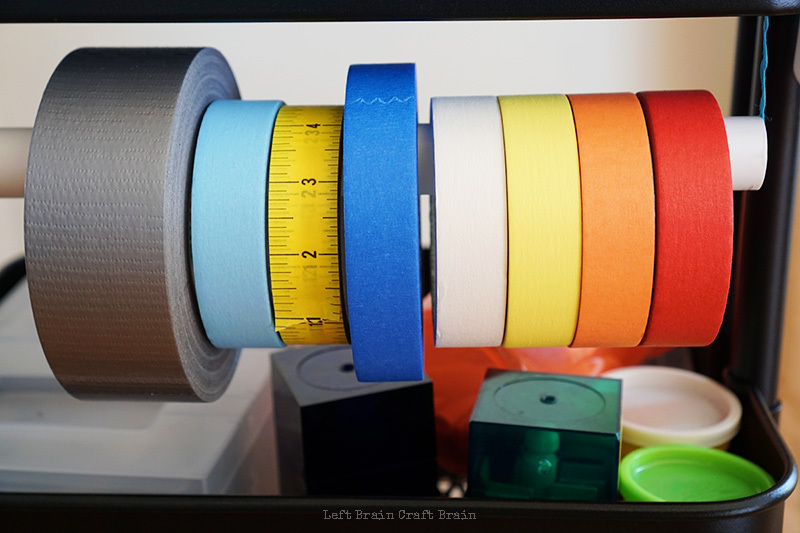 One of our favorite parts of the cart is the tape roll. It’s super easy to put together. Hop over to the hardware store and get a length of PVC pipe. Cut it just narrower than the width of the cart. Then grab some ribbon or string 2.5 times the length of the pipe and feed it through. Add your tape roles to the pipe and tie the ribbon onto the cart, cutting off any extra ribbon. You can also use this message to hang a roll of art paper, too. A lot of my Mini Maker Space Cart was filled with stuff from Walmart. Because I don’t want to be constantly watching over my daughter’s shoulder saying “Don’t use that much tape!” And that means I need low prices. So be sure to stock up on all those creative making supplies you need to inspire your kids!